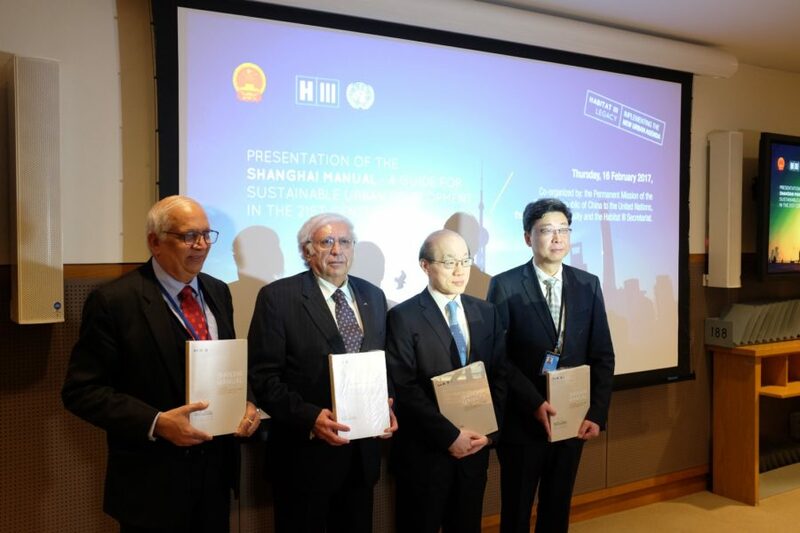 The Shanghai Manual 2016 – A Guide for Sustainable Urban Development in the 21st Century was jointly presented today at the United Nations Headquarters in New York by the Permanent Mission of the People’s Republic of China (PRC) to the United Nations, the Shanghai Municipality, and the Habitat III Secretariat. The publication, launched last October during the World Cities Day Forum within the Habitat III Conference in Quito, Ecuador, is a collection of case studies, experiences and expertise drawn from around the world on how we can create a sustainable urban future together. The first edition of the Shanghai Manual was presented in 2011, following the 2010 World Expo in Shanghai, China. The initial purpose of the Manual was to serve as a tool to support mayors and urban managers in achieving sustainable urban development in their communities. The 2016 edition, which addresses a wide range of issues as well as contains analysis and model case studies, was compiled by the United Nations, the International Exhibitions Bureau, the Ministry of Housing and Urban-Rural Development of the People’s Republic of China, and the Shanghai Municipal People’s Government within the context of the United Nations Conference on Housing and Sustainable Urban Development (Habitat III) and the New Urban Agenda. The presentation in New York was moderated by Habitat III Secretariat Coordinator Ana Belen Moreno, and distinguished guests included Ambassador Liu Jieyi, Permanent Representative of the PRC to the UN; Ambassador Horacio Sevilla Borja, Permanent Representative of Ecuador to the UN; and Mr. Liu Qianwei, Chief Engineer, Shanghai Municipal Housing, Urban-Rural Development and Management Commission. “This book based on the status quo of cities’ development worldwide after 2010 and with a number of selected prospective cases will further carry forward the idea and theme of sustainable urban development,” said Engineer Liu Qianwei, attending the event on behalf of the Shanghai Municipal Government. A panel discussion soon followed with Mr. Tu Qiyu, Deputy Director, Institute of Urban and Demographic Studies, Shanghai Academy of Social Sciences; Mr. Thomas Dallessio, President, CEO and Publisher of NextCity; and Mr. Kumaresh Misra, Deputy Secretary-General of the Habitat III Conference, who all elaborated on the implementable knowledge of the Manual and its value for all types of urban actors as a living document and toolkit that would evolve in response to cities’ differentiated needs and the varied contexts of its users. The Shanghai Manual will be updated annually as part of the implementation of the New Urban Agenda and the 2030 Agenda for Sustainable Development, with World Cities Day as the main platform through which its work and content can be promoted. The Shanghai Manual is available for download here.